The Toastrack (as it is known locally) is partially finished and indeed some residents have moved in and some of the commercial space has been let to restaurants. 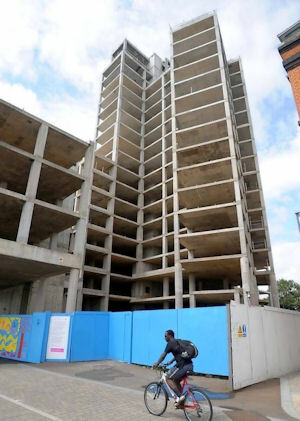 Unfortunately the economic recession means that funds are not available to complete one of the blocks of apartments (see the photo above), nor the planned Travelodge hotel. Thanks to Sarah Katherine James for guiding me to Regatta Quay.